The EADSM Accreditation Programme is a voluntary instruction and assessment process leading to certification of competency and optimal multidisciplinary care delivery for patients suffering from sleep-disordered breathing. Its purpose is to improve the participants’ knowledge of the prerequisites required to deliver adequate dental sleep medicine care focusing on oral appliance (OA) therapy and to promote the multidisciplinary treatment of sleep-related breathing disorders such as snoring and obstructive sleep apnea (OSA). dentistry, nor does it grant or imply any legal qualification, privilege or license to practice dental sleep medicine. It can, however, be expected to become of primary importance in the future organization of dental sleep medicine in Europe. PLEASE DO NOTE: EADSM does not offer EADSM Accreditation for members that have access to their own national accreditation pathway in dental sleep medicine. It is imperative that such members should obtain accreditation through their national channel first, upon which the EADSM Accreditation will be granted upon request. 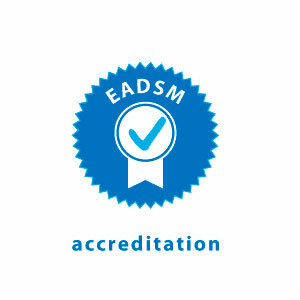 Such members can take the EADSM Accreditation exam for whatever reason they like but they should be aware of the fact that currently EADSM Accreditation levels are not always considered equivalent by their national society – please enquire with your national society.